As the country continues to shiver in icy winter temperatures, cool crisp salads may not come immediately to mind when deciding what to do for dinner. But there are wonderful vegetables that cry out for salad treatment during a season bereft of fresh fruits and vegetables. Sweet jicama and herbaceous celery root, or celeriac, pair perfectly with tart apple in a salad dressed in Dijon mustard, lime juice, olive oil, and mayonnaise, traditionally known as rémoulade sauce. These crispy bulbs aren’t as common on our winter tables as potatoes and beets, and that’s a shame. Their flavors are surprisingly delicate given their gnarly exteriors, making them extraordinarily versatile when paired with other winter flavors. Fall apples get a late winter boost in combination with the crunchy roots. The Dijon and vinegar add zip and temper the richness of the mayonnaise making for a creamy dressing that doesn’t overwhelm the delicate flavors of the jicama and celeriac. 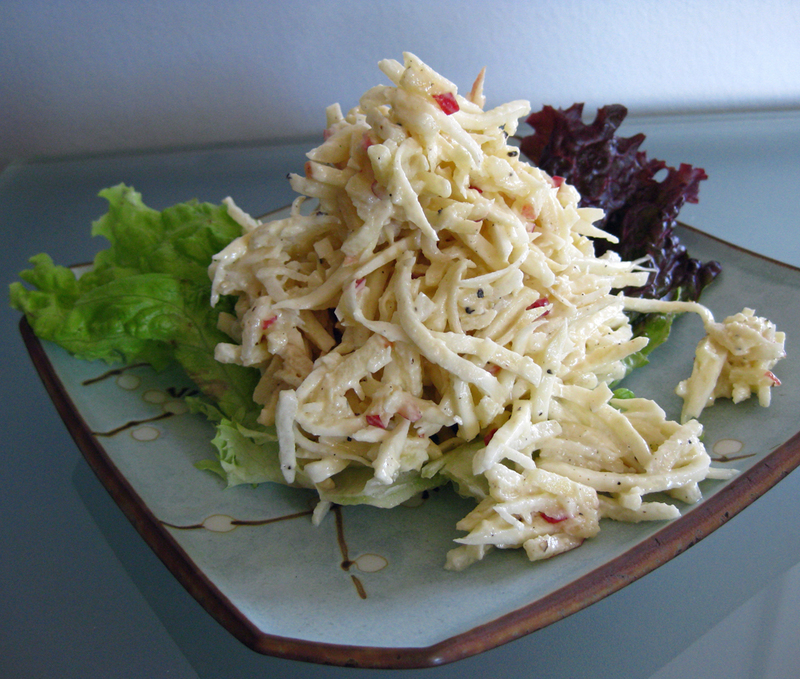 Traditionally, the celeriac rémoulade is a French dish but the addition of jicama and lime juice adds a little tropical touch to this cool weather salad. For the purest of winter white salads, peel the apple before shredding. But if the apple is organic, leave the peel on for a touch of color and added nutrition. This is a great dish with boiled shrimp, fried oysters, crab, or any seafood. Serve along side Po’boy or Muffuletta sandwiches or as a salad on your Mardi Gras buffet. Peel the celery root and jicama. Using a mandolin with the match stick blade or a food processor with a grater blade, grate the jicama, celery root and apple. Place into a bowl and toss with the juice of half of the lime, to keep from browning. In a separate bowl, mix together the mayonnaise, olive oil, rest of the lime juice, Dijon mustard, and salt and pepper. Combine the dressing with the salad and adjust the salt and pepper. This dish can be made the day before without becoming soggy. Thanks, Paul! The addition of the jicama adds a nice sweet crunch to this very traditional salad. You guys need to try it at home.